1. Prep your eyes with concealer Concealer can be used to cover up under eye circles or just the bluish discoloration just under your inner eye. To cover dark under eye circles, apply three dots of concealer under each eye. Start at the inner corner where skin tends to be darkest, then under the pupil and the third on the outer edge. Pat, never rub with your ring finger (this finger tends to have the softest pad) until it disappears. 2. 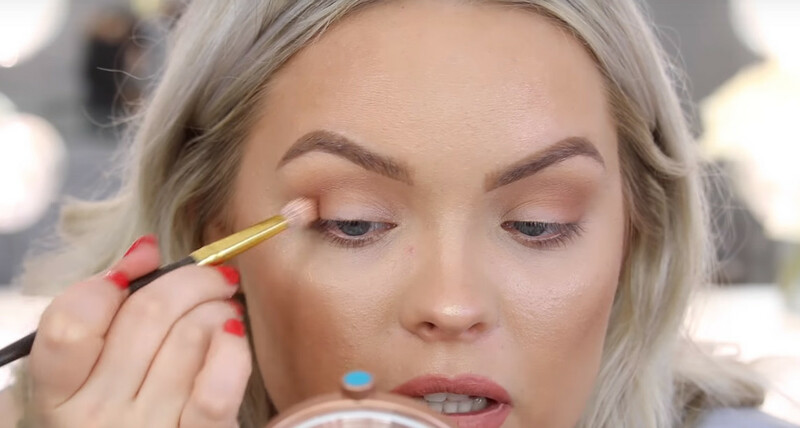 Apply eye base to your lid Eye base is the secret to keeping your shadow in place for hours. Without properly priming your lid first, your eye shadow will likely end up a greasy line in your crease. 3. Apply shadow. It’s great to use a three-toned shadow and build from lids to brow. Allowing them to blend into each other like a rainbow is gorgeous, according to celebrity makeup artist Mally Roncal. Start with a light color that almost matches your lid. Sweep the color across the lid and up to your browbone. Follow with a medium color across your lid only. Build on this with a darker color in the crease. Blend the colors well. 6. Highlight your brow Take the same highlighter and dab it on your brow bone, concentrating on your mid-brow outward. Blend with your finger. 7. Curl lashes An eyelash curler will make even long lashes look more gorgeous. For added effect, you can heat the curler under a blow dryer for a couple seconds. Test curler before applying to lashes because you could burn yourself. 8. Apply mascara Place the wand of your mascara brush at the bottom of lashes and wiggle back and forth. Follow with another few sweeps of the wand. Apply to bottom lashes as well.